ULTRASONIC CLEANING CHEMICALS | Process Equipment & Supply, Inc. 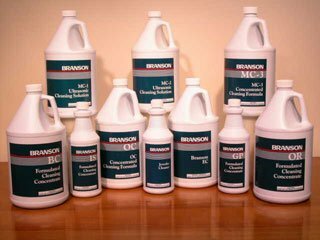 Process Equipment offers a complete line of Branson ultrasonic cleaning concentrates for many applications. Quart bottles, packaged as 4, 8, or 12 to a case, are always in stock. Fifty five gallon drums are also available; please contact us for pricing and delivery information. Please note that chemicals may not be returned. Chemicals are shipped with instructions and MSDS. Chemicals can only be shipped to destinations within the continental U. S. and Canada. Sorry, but they cannot be air shipped. Branson EC Electronic Cleaner Concentrate is a biodegradable, phosphate and caustic free alkaline cleaner formulated for heavy-duty industrial use. EC Concentrate solution is formulated to remove oils, resins, rosins, and other typical soils from hard surfaces normally encountered in the electronic, plating and other related industries. Applications include: cleaning of infrared detectors, electrical contacts and leads, ceramic insulators, and other electronic components during manufacturing or assembly. Whether cleaning through-hole or surface mount boards, Branson EC does the job effectively and ergonomically. Branson EC is mixed with water in a concentration of 2 to 5% by volume and can be used at temperatures ranging from 130 to 160 degrees F (55 to 72 degrees C). Optimum temperature is 140 degrees F (60 degrees C). Branson GP General Purpose Cleaning Concentrate is a biodegradable caustic-free alkaline cleaner formulated for general purpose cleaning and maintenance cleaning where soil levels are relatively light. GP concentrate solution is ideal for removing a wide range of soils like fingerprints, dust, packaging participates, and light oils and greases from metalworking and light machining operations. Applications include: metal stampings and machined components, glassware, rigid injection molded parts, and other components with light-to-intermediate soil levels. Branson GP is mixed with water in a concentration of 10 to 12% by volume and can be used at temperatures ranging from ambient to 180 degress F (82 degrees C). Optimum cleaning performance is achieved at higher temperatures. Branson IS Industrial Strength Cleaning Concentrate is a biodegradable, phosphate-and caustic-free alkaline cleaner formulated for heavy-duty industrial use. Branson IS solution readily removes heavier greases, oils, and particulates, as well as drawing lubricants and light carbon deposits. Applications include: removal of heavier soils from automotive, aircraft, and similar mechanical components, and cleaning prior to secondary finishing operations (including painting, plating and electrostatic coatings). Branson IS is mixed with water in a concentration of 8 to 10% by volume and can be used at temperatures ranging from ambient to 180 degrees F (82 degrees C). Optimum cleaning performance is achieved at higher temperatures. Branson LRS Liquid Rust Stripper Concentrate is a double-chealated, highly caustic, non-foaming cleaner and degreased. Branson Liquid Rust Stripper used for de-rusting and de-scaling of ferrous metals. It is also used for paint stripping and general heavy degreasing. It is not appropriate for cleaning reactive metals like aluminum or zinc. Applications for this aggressive cleaner include: injection mold cleaning, removal of non-pitted rust deposits from ferrous metal, removal of carbonaceous soils from internal combustion engine parts, and the cleaning of food processing equipment. Branson LRS is mixed with COOL water in a concentration of 4 to 8 ounces per gallon and can be used at temperatures ranging from 160 to 180 degrees F (72 to 93 degrees C). Optimum cleaning performance is achieved at higher temperatures. Branson MC-1 Metal Cleaner Concentrate is a biodegradable, phosphate and caustic-free alkaline cleaner formulated for heavy-duty industrial use. It displaces soils by carrying them to the surface for easy removal manually or with a skimmer. MC-1 concentrate solution removes fabricating, cutting, and publishing oils, greases, and a wide variety of soils from aluminum, aluminum alloys, copper, brass, and steel substrates. Branson MC-1 is mixed with water in a concentration of 7 to 10% by volume and can be used at temperatures ranging from ambient to 120 degrees F (48 degrees C). Optimum cleaning performance is achieved at higher temperatures. Branson MC-2 Metal Cleaner Concentrate is a biodegradable, phosphate and caustic-free alkaline cleaner formulated for general purpose and normal maintenance cleaning applications. MC-2 Concentrate solution is an emulsifying cleaner, holding soils in solution and preventing them from redepositing on cleaned parts. MC-2 Concentrate solution removes oils, greases and a wide variety of solids from ferrous metals, stainless steel, titanium alloys, copper and copper alloys. It is not recommended for aluminum or aluminum alloys. Branson MC-2 is mixed with water in a concentration of 7 to 10% by volume and can be used at temperatures ranging from ambient to 180 degrees F (82 degrees C). Optimum cleaning performance is achieved at higher temperatures. Branson MC-3 Metal Cleaner Concentrate is a biodegradable, phosphate and caustic free alkaline cleaner formulated for heavy-duty industrial use. MC-3 Concentrate solution is an emulsifying cleaner holding soils in solution and preventing them from re-depositing on cleaned parts. MC-3 concentrate solution removes oils, greases and a wide variety of soils and should be used when an emulsifier is required to clean aluminum and aluminum alloys. Branson MC-3 is mixed with water in a concentration of 7 to 10% by volume and can be used at temperatures ranging from ambient to 160 degrees F (70 degrees C). Optimum cleaning performance is achieved at higher temperatures. Branson OC Optical Cleaner Concentrate is an alkaline non-foaming, liquid detergent formulated for the optical glass and lens manufacturing industry. It is designed to be particularly free-rinsing, minimizing residual haze. It removes general soils, fingerprints, cerium oxide, pitch, and some blocking waxes from optical lenses. It is very effective in removing polishing compounds from glass and optical surfaces prior to deposition of coatings. Applications include cleaning of opthalmics and other lenses during manufacture, laser components, and quartz crystals following lapping. Branson OC is mixed with water in a concentration of 7 to 10% by volume and can be used at temperatures ranging from 130 to 180 degrees F (55 to 82 degrees C). Higher temperatures are required for waxy soil removal. Branson OR Oxide Remover Concentrate is a blend of non-ionic detergents in an acidic base. It is a phosphate-free and biodegradable. Branson OR rapidly removes rust and other oxides from metals. Caution should be used with this acidic material. Typical applications include: oxide removal following soldering, brazing, welding, and similar operations. Branson OR is mixed with water in a concentration of 6 to 7% by volume and can be used at temperatures ranging from ambient to 120 degrees F (48 degrees C). Optimum cleaning performance is achieved at higher temperatures. Branson Jewelry Cleaner Concentrate is a specialized biodegradable, phosphate-free alkaline cleaner for cleaning jewelry and precious metals. Jewelry Cleaner solution removes the general soils, particulate, soaps, hand creams, and oxides that can accumulate with normal use. Typical applications include precious metals, gemstones and certain costume jewelry (both during manufacturing and for restoring their original brilliance after wear). With this free-rinsing solution, the luster of rings, watchbands and similar pieces is assured. Branson JC is mixed with water in a concentration of 10 to 12% by volume and can be used atient to 140 degrees F (60 degrees C). Branson BC Buffing compound Concentrate is a biodegradable, phosphate and caustic free cleaner developed for removing buffing compound. A blend of non-ionic surfactants, detergents, and emulsifiers, Branson BC has been formulated to remove the most difficult buffing compounds and carriers. The non-viscous liquid rapidly removes tripoli, rouge, lime, diamond tripoli, etc. from buffed compounds and it rinses freely and quickly. Branson BC is mixed with water in a concentration of 6 to 7% by volume and can be used at temperatures ranging from ambient to 180 degrees F (82 degrees C). Optimum cleaning performance is achieved at higher temperatures.